The CN8500 Series temperature controller is versatile and user-friendly. The operator needs to review only those parameters relevant to the particular application. A dual digital display offers optimal process information at a glance. The dedicated upper display shows the process temperature, while the lower display displays setpoint and setup parameters. Individual LEDs identify the status outputs, alarms, digital communications, and special options. 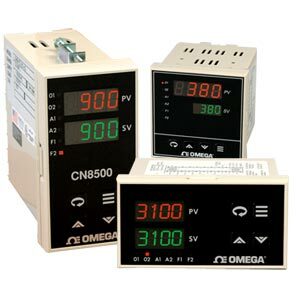 The CN8500 Series features a NEMA 4X front panel and a universal power supply that accepts 103 to 253 Vac and 103 to 330 Vdc. Control algorithms available are P, PI, PD, PID, and on/off. The autotune feature automatically sets proportional band, rate, and reset before the process reaches setpoint. These parameters provide quick stabilization of both the heating and cooling process without overshoot, hunting, or cycling. The standard dual control outputs can be configured in a variety of control and alarm applications such as heat, heat/cool, heat/alarm, cool, or cool/alarm. The ramp-to-setpoint feature allows the user to define the rate of rise to reach the setpoint, thus minimizing thermal shock to the load during start-up. Nota: OMEGACARESM extended warranty program is available for models shown on this page. Ask your sales representative for full details when placing an order. OMEGACARESM covers parts, labor and equivalent loaners.